I feel that I’ve come to a crossroads in looking into my past lives. A lot of it hinges on whether or not I can match my memories from the Middle Ages with an actual person or not, but some of it hinges on lingering doubts about my memories of 1877-1915 as well. If the version of these lives in sequence is correct, then the lesson is clear: the opposite of your worst decisions isn’t necessarily the best decision. If I joined the army after reflecting on a life where I chose not to be a soldier previously, then I should take that warning to heart. It would mean that rather than never fighting for anything, or fighting at the first chance I get, I have to make sure the fight is really mine before I join it. But if this is all just a fantasy that I’ve spun in my head, then maybe I’m just fooling myself and I should go back to living my life exactly as I did before… or maybe the value of the lesson isn’t bound to whether or not the events actually happened. I don’t know. I feel lost and confused and completely unsure how to integrate these experiences, or if they can be integrated at all. It’s one of the many excuses people rushed to after two world wars ravaged Europe and a third threatened to break out, all before the 20th century was over. It’s an utterance that has become almost a reflex. We say it without ever thinking. Whenever someone does something cruel or selfish or underhanded, we just shrug and say “human nature,” and walk away with our view of humanity diminished slightly more. Consider violence. Now, a lot of us are familiar with the Biblical narrative of Cain and Abel, said for many generations to be an authoritative account of the first murder. For hundreds of years, the Western world has lived with the presumption that it only took one generation for murder to enter the repertoire of human behavior. When one considers it that way, a deterministic outlook on violence is pretty hard to avoid. However, the archaeological record stands in sharp contradiction to this. While the human species itself dates to 195,000 years ago, according to the fossil record, we don’t really see a whole lot of evidence of violence between human beings until the Upper Paleolithic (about 30-40k years ago). Now, if a species goes more than 70% of its history without a behavior, then suddenly starts doing it in one short period of prehistory, you can sort of guess that this is not something that just “comes naturally.” In that context, the story Cain and Abel seems like a fairly cruel lie to normalize violence than a parable against it. So how did early humans and hominids actually treat each other before the Upper Paleolithic? Were they just heavy-browed, heartless brutes walking around in leopard skin tunics carrying heavy wooden clubs as the popular masculine fantasy of “cave men” would have us believe? While there’s not a lot of material left from that time period, what we do have are a few clues to how the ancestors of today’s human population related to each other and the world, and it’s rather astonishing. Homo Erectus cared for their injured, young, and sick. We see skeletons with evidence of healed fractures, something that is indicative of a highly social species willing to go the extra mile to save a family member. Neanderthal made music with reed instruments of bone, and buried their dead in careful, deliberate ceremonies, even laying flowers on the corpse before burial. Tens of thousands of years before their descendants went to war, a human being on the coast of what is now South Africa drilled holes in seashells and made themselves a lovely necklace out of what would have been just garbage from the previous nights meal. As we would say in Portland, they were upcycling way before it went mainstream. Over 30,000 years of sedentary settlements and around 6,000 years of civilization, the true narrative was nearly replaced with a narrative of control, conquest, and subjugation. These things became normalized and enculturated… but they’re not true to the broader spirit of what it means to be human. In fact, the whole body of evidence for human evolution discovered thus far hints at a gentle creature for whom violence and unchecked egoism is the exception, not the rule. Art, love, and family were with the species long before violence and jealousy. That, friends, is the truth about human nature. One of the places I was fond of visiting when I lived in South Carolina, and one that often stirs memories that I equate with the song “Scarborough Faire” (along with the ruined abbey in Shropshire and the old plantations in Charleston) is Mepkin Abbey. Mepkin Abbey, interestingly enough, is a Cistercian abbey just like the ones outside Shrewsbury were. Only it’s active. Anyhow, it’s fascinating that two Cistercian abbeys figure into this, and that I had meaningful conversations in history with the monks at Mepkin Abbey. This doesn’t prove anything but it does put it in the “weird when you think about it” category. It seems that song may have been what caused me to remember that abbey from that earlier life in my previous one when I heard its faux-medieval lilt some time after moving to Hereford (it had only been popular in its current setting around Yorkshire since the 1890s and would have taken a while to get that far south, but I think it’s reasonable that I could have heard it). I think this isn’t the first time I’ve remembered past lives. I can’t remember a specific moment when I said “A Ha! I remember now!” back then, but I have the general sense that I was in that abbey near Shrewsbury and that I knew damned well why I was there. I think I may have decided that my decision to not become a soldier all those centuries ago was the wrong one. I think that’s why I joined the Shropshires instead of going into a regiment out of Herefordshire or Somerset like I’d expect myself to. I can’t prove it but really feel that’s the answer. I found another one of my memories to be implausible, at least in part. The memory of the long-dead French soldier identifiable only by his helmet couldn’t have happened, since the French didn’t adopt a steel helmet until summer 1915. I couldn’t possibly have seen a soldier dead for many months in 1915 wearing an Adrian helmet; in fact before then the Germans were the only ones with any sort of helmet at all, and it wasn’t steel. Thing is, I’ve confirmed enough details and found enough things about me from before I had these memories, that I’m not sure I’m in the realm of an easy coincidence any more. But when my memory pulls tricks like this I’m never sure whether to trust it for anything. Is it possible at least some of the memories of steel helmets are true? The only history I can find on this is of models developed by and for the military, but I don’t know if anyone offered these helmets as an optional commercial accessory before then. I know a lot of things (like trench watches) were never official kit but a lot of soldiers had them, so this is not such a far-fetched idea. Also, the Adrian (French) and Brodie (British) helmets were very similar to styles that go back many years. The Adrian is similar to brass helmets worn by French firemen long before the war. Also, before the Brodie, a similar helmet called the “Chapel-De-Fer” existed in England since before the Norman Conquest. I honestly can’t imagine, with a war going on and lots of people getting killed by shrapnel from overhead, that nobody thought to resurrect such a simple design before 1916 and I would be surprised if I didn’t find out that French soldiers took helmets from firemen, or that the British often had home-made or privately-retailed steel helmets long before the official issue. Trouble is, at the moment I have no evidence of this. Once again, I am in dire need of help for research materials here. This doesn’t make sense; either I keep seeing these helmets where they shouldn’t be and all of my memories are therefore suspect, or I recall these details because they really happened and I’ve remembered something that historians forgot. If I were to place my bets on the odds here, I’d put them on my memories being suspect. But on the off chance I do uncover something, this could be a real watershed moment because up until now, I’ve only confirmed things that were not terribly difficult to research and didn’t exactly rock the boat with conventional history. This is a whole different thing because my memories are hinting that the history books forgot a very important detail about the average kit we had. 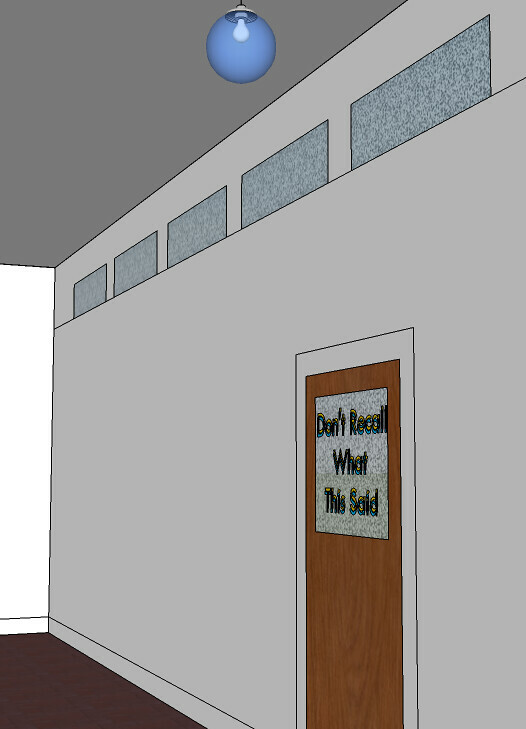 I’ve done a 3D model that approximates how that corridor looked. The globe light is a detail I remembered as I made the model in Sketchup. I also plan to do a model of the actual dormitory in the barracks, but that will take time as it’s a more intricate model. I had planned to do a model of the theatre building with the unusual proscenium as well but I have to figure out how to do that without rendering all the fiddly seats and other details that would make the model too large for my computer! I realized that I’ve yet to offer any of the resources that helped me with my research! Depending on the amount of detail you remember about your previous life, your mileage may vary, but I hope that at least one of these resources will help. A forum mainly for children and their parents, but because adult recalls like mine are a bit rare and unusual there are a few adult users there as well. Good starting point, and some of the users there really helped me with my research (many thanks), but the forum has limitations including a word filter on posts. Worth a look for anyone experiencing memories of a past life, but look on your own for past life forums elsewhere online too because you’re going to need them. Before I knew what my name, rank, serial, and regiment were, I had only a memory of a grave next to an old hardwood tree near a fence with angled bricks. The CWGC’s archive of cemeteries gave me the visual reference I needed to positively identify the cemetery, and has an index of plot numbers by name that is very helpful! Also, if you’ve ever marveled at the clean, well-kept cemeteries and monuments to British war dead, you can thank this agency for keeping their memory alive in stone, brick, and turf. Ancestry UK has an exclusive contract with HM government to host digital copies of the records of soldiers from the Great War. While I personally never could locate my records, a user on the Child Past Lives forum found them and was able to help me fill in a lot of blanks with information from this site. In addition to military records, they also have census records (which is how I know the streets I lived on and towns I lived in during my previous life, and how I was able to confirm the memory of the street I lived on in the first place). Right now, there are scores of documentaries on YouTube pertaining to both WWI and reincarnation. Take advantage of them before changes in site administration and internet-killing legislation makes them unavailable. Just be careful to take some of the videos on reincarnation with a grain of salt, since YouTube is also home to a bevy of conspiracy theorists and loaded with unsubstantiated claims about just about everything. I would not recommend breaching the topic of reincarnation here since it is a serious historic forum. However, the user community includes people with access to detailed records and they can help confirm a lot of details about battles you fought, the unit you served in, and the everyday lives of soldiers. And if any of you are just uncovering a past life, please know this: You are not alone, you are not the first to feel this pain, and chances are, you’re not crazy. It’s a very harsh thing to deal with, especially if your memories point to war when that’s the last thing you’d want in this life. It can make your life difficult, and it can certainly reopen a lot of old wounds. One important thing to remember is that the present matters more. It can be easy to start living in the past, to even start identifying more with the era from your most recent past life than with the current one, and to start obsessively digging deeper and deeper to see just how much you can recall. Never forget to take time to live in the moment and think of yourself as the person you were born as in this life. That being said, with a keen memory of the past you can come to have a new-found appreciation for the present! We really do live in an age of wonders, and it would be a shame to forget that. For the first time in history, we can come together across long distances and talk about experiences like this and we’re finding that although it’s rare and unusual, there are others who have been through the exact same thing and we’re here to tell you it’s going to be alright. Most importantly, never forget the lessons you have learned from recalling a previous life. This is a great gift toward self-improvement and it would be a horrible waste to not consider the past when planning for the future. Not everyone has such a broad path to these lessons. I seem to remember what the actual dormitory part of the barracks looked like. New recruits were on the top floor of the building, in a loft. I can’t remember if there were exposed beams or not, but the ceiling was finished with white stucco and sloped upward, or may have gabled above us. There were windows, it seems they were in large dormers big enough for two or three of us to stand in them comfortably. The beds were single-level, and made with thick bent steel much like hospital beds of the time. There were perhaps a hundred of them in all, close together and in 3 or 4 rows. Once again, I’m at a loss to actually research this. Any help will be greatly appreciated.